It's time to announce the winners of our first Manager of the Month Awards of the season- with a new sponsor. Many thanks to Anderson Travel for their support. Premier Division: Steve McKimm- Tonbridge Angels. Five league matches. Four wins and a draw. Not a single goal conceded. August really couldn't have gone much better for Tonbridge Angels, so our award goes to Steve McKimm and the plaudits to his high-flying side. North Division: Paul Martin- Romford. Only a few short months ago Romford needed victory on the last day of the season to avoid the drop into the Essex Senior League. What a difference a summer makes! In August Paul Martin led The Boro to two wins in the League- and a draw, another win in the FA Cup, and their only loss came on penalties in the Velocity Trophy after a 3-3 draw with Ware. Congratulations Paul! South Central Division: Carl Davies- Bracknell Town. Four matches, four victories, and twelve goals- the Robins would have struggled to dream of a better start to their Bostik League campaign. With an average of three goals per game in August, Carl Davies deserves the plaudits for the performances of his Bracknell Town side. South East Division: Gary Alexander- Ashford United. Three league victories, eight goals scored, only one conceeded. Gary Alexander was no stranger to the Manager of the Month Award at Greenwich Borough, but now he has his first for the Nuts and Bolts. 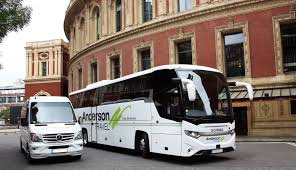 Anderson Travel are one of the most respected coach companies in the UK, with more than 30 years experience of delivering premier coach travel across the South East, UK and Europe. To get a competitive quote for your travel needs, and excellent customer service, please email sales@andersontravel.co.uk or call 020 7403 8118.